Fresh water is used every day for drinking, cooking, bathing and washing. It is also needed for hydrating and cleaning livestock and watering essential food plants during dry periods. These requirements are usually met by the women and girls who are daily fetching the water from the nearest source. Water sources vary between open wells, nearby streams, communal taps, or, in many places, public hand pumps. For many households these water sources are several hundred metres walking distance from the house. The women are used to the heavy work of carrying the large vessels with cheer and smiles along well-tread paths. However, they may spend several hours every day on this task, leaving them little or no time for other matters, such as education, earning additional income, being with their children, or even getting sleep. Recognising this hardship and the burden women undergo, Amma has made it a priority to ensure accessible, clean and dependable water sources in the villages. Amrita SeRVe and departments of Amrita Vishwa Vidyapeetham have collaborated to assess the current state of water access, repair existing infrastructure and carefully plan and execute the construction of new distribution systems. Amrita Vishwa Vidyapeetham’s Center for Wireless Networks and Applications (WNA), the Department of Civil Engineering and the Live-in-Labs® programme joined forces with the Amrita SeRVe team to design and build low- cost water distribution systems in the villages of Pandori (Jammu), Harirampura (Rajasthan), Guptapada (Odisha), Gudipati Cheruvu (Andhra Pradesh) and Komalikudi (Kerala). Such systems generally consist of laying underground pipes from natural water sources or borewells to overhead storage tanks in the village, as well as installing taps at various strategic locations throughout the villages. In some places existing infrastructure has been either repaired or extended. For example, when one hand pump was repaired in Ratanpur (Bihar), an additional four handpumps were built in the community. In Valaramkunnu (Kerala), an existing pipeline between a nearby dam on a mountain stream had been destroyed by wild elephants, cutting off the entire fresh water supply to the village. 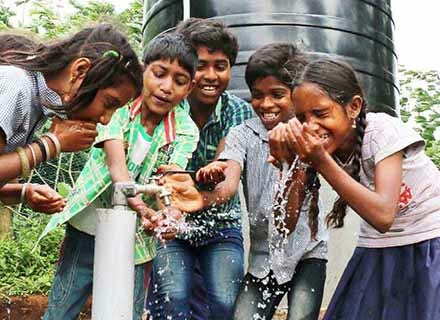 Amrita SeRVe laid a new water pipeline over the distance of around three kilometres to restore a dependable freshwater supply to the village. In September 2017, Amma launched the Jivamritam clean drinking-water initiative in the presence of India’s President, Shri Ram Nath Kovind. The goal is to provide water filtration in 5,000 villages throughout India. Each Jivamritam System is capable of filtering the daily drinking-water needs of up to 400 five-member families. This nationwide campaign has also been implemented in some Amrita SeRVe villages. Jivamritam systems are already up-and-running in Indpur (Himachal Pradesh), Nani Borvai (Gujarat), Naglachandi (Uttar Pradesh) and Gudipati Cheruvu (Andhra Pradesh), with several more locations under way. Amrita Vishwa Vidyapeetham’s AMMACHI Labs has been leading the 101 villages toilet-construction programme, which aims to improve public health as well as transforming the lack of basic hygiene facilities into economic empowerment. Its approach is focussed on strengthening women through skills training, income generation and SHGs. These three elements are the pillars on which the open-defecation-free village campaign was built. AMMACHI Labs has been offering a training course to interested women on the construction, installation and maintenance of new toilets in their communities. The course covers the basics of plumbing, masonry and construction skills. Women can benefit from these professional skills to take on related jobs or come together to start a toilet-construction business. They are also instructed in the importance of hygienic practices. By putting this knowledge into practice, these women are becoming ambassadors for change in their communities, helping to raise awareness and improve sanitation facilities. The Amala Bharatam Campaign (ABC) is an expression of Amma’s commitment to support the ‘Clean India Movement’. It is an Amrita-designed initiative launched in 2010 and introduced to the villages since the very beginning of the Amrita SeRVe project. Encompassing regular clean-up drives with children and SHG members, we have conducted more than 700 drives in 34 villages, during the last three years alone. The results of these efforts can clearly be seen today, where the villages are cleaner and the people regularly demonstrate they have more awareness in handling waste.